If someone had told me a few years ago that butter free microwave popcorn dusted with nutritional yeast would be my new favorite snack, I probably would’ve looked at them like they were a three headed dog guarding the gates to the underworld. If you’re anything like I was just a few weeks ago then you’re probably wondering what in the holy hell is noocho cheese anyway?!? It’s utter delicousness, my friends. Pure genius, and it’s actually good for you too! I have always been a popcorn lover. It’s one of my favorite go to snacks, so when I was perusing Pinterest the other evening and ran across this recipe, I just knew I had to try it. I was so intrigued! I like to eat popcorn on a regular basis, but I can’t take standard, store-bought microwave popcorn anymore. The thought of all of the chemicals and preservatives that are loaded into it nowadays just totally skeevs me out. I’m also waaaay too lazy and impatient to try to make it on the stove top. Plus out of the two times I’ve actually tried to do it that way I’ve ended up scorching it. Yeah…I’m never trying it again. That’s why I now solely brown bag it. If you haven’t made your own microwave popcorn in a brown paper bag yet then you are in for a real treat. It’s so incredibly easy and it’s just as convenient as store bought microwave popcorn without all the crap! Seriously all you have to do is dump some (preferably organic) popcorn kernels into a brown paper bag, roll it up, then nuke it for like 2-3 minutes. That’s it! Well, that’s almost it. I’m also one of those people who absolutely *CAN NOT STAND* to have leftover popcorn kernels at the bottom of the bowl. It drives me bonkers and makes me want to kick my cat. I would never do that BTW. I usually end up dumping all of the popped corn into a bowl, season it as desired, then microwave it again until there is just a second or two in between pops…or a slightly burnt smell twinges my nose. I also used to be a popcorn seasonings skank. At any given time I’ve been known to have at least 3 different kinds of flavorings in our pantry, but, since giving up frakenfood, I’ve taken to making the spices myself. Savory popcorn will always be my first pick, but I won’t hate on kettle corn every now and again. 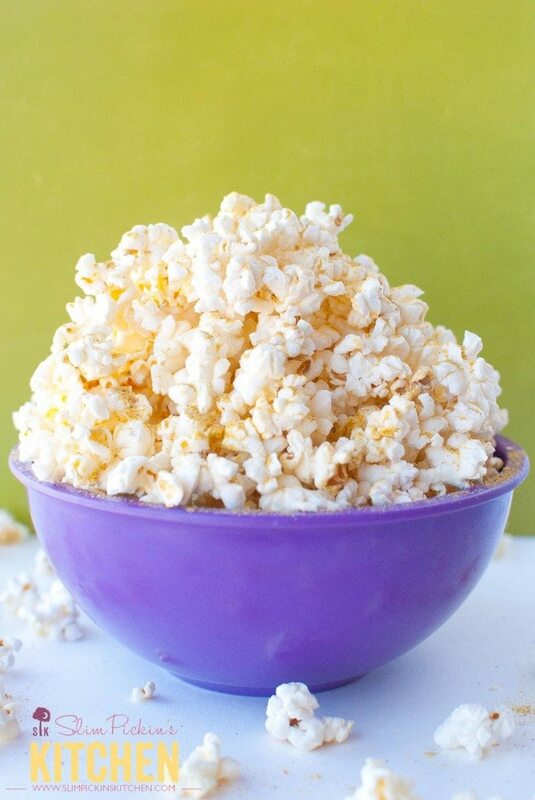 Since this butter-free microwave popcorn is so easy, it would be killer to serve at the Superbowl this weekend! How hilarious will your macho, football loving friend’s faces be when you tell them they’ve been scarfing down mountains of nutritional yeast! Ha! 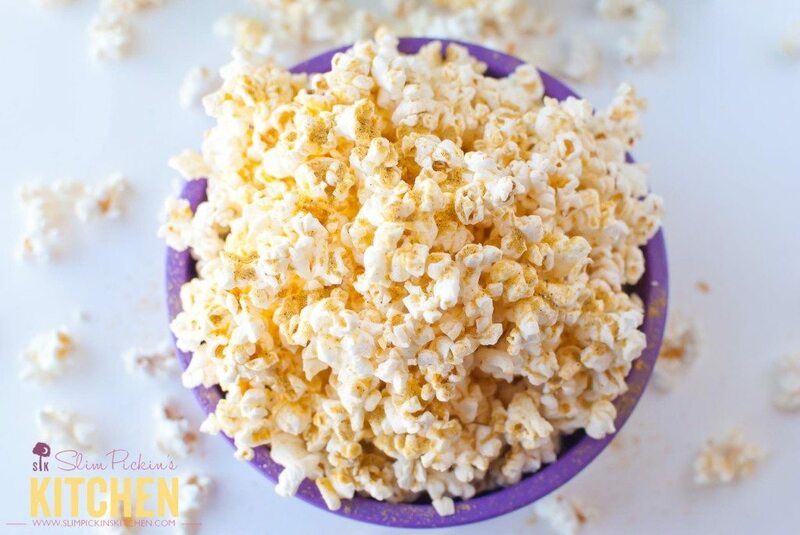 A super healthy, butter-free microwave popcorn made with nutritional yeast! Add nutritional yeast, cumin, chili powder and salt to a small bowl and stir until well mixed. Set aside. NOTE: I whizzed mine through a spice grinder a couple of times to make it into a powder, but you don't have to. Dump popcorn kernels in a brown paper bag, roll it up, and microwave on high for 2-3 minutes or until there is a second or two in between pops. 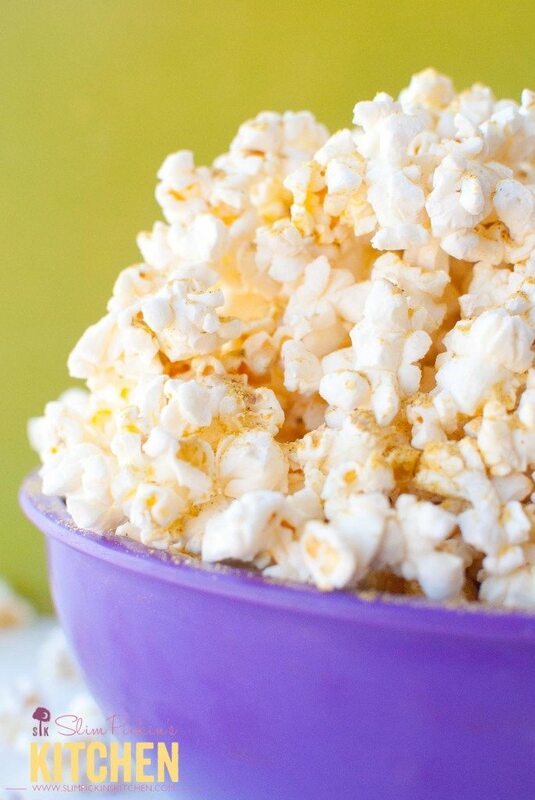 Pour popcorn into a bowl, spritz with coconut oil and dust with noocho cheese. 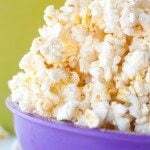 To ensure even coating, stir the popcorn around a bit then spritz and sprinkle some more until well coated. 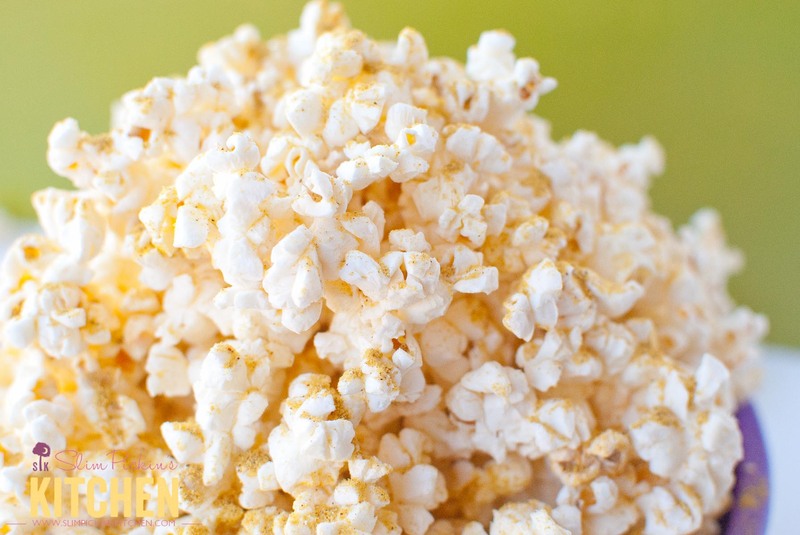 I haven’t done a lot of experimenting with nutritional yeast – or really even cooked with it at all, but this popcorn looks too good to pass up! Can’t wait to try this! Believe it or not, this was my first experiment too! When I first tasted it I wasn’t sure if I liked it, but then, like kale chips, I kept going back for more and more and more. By the time the bowl was gone, I was in love! I”m totally addicted to popcorn… I’ve been known to eat it for a meal! I’ve been popping my own for years (I actually bought a stovetop popper), but I love the convenience of the paper bag in the microwave! My go-to topping is butter, parmesan, and pepper. BUT, you really have me intrigued with this recipe… I definitely have to try it! OMG. I’ve eaten popcorn as a meal on many occasion! It’s deft one of my fav foods. I also love to pour a bit of melted ghee on it every now and again too, but I can’t do that every time b/c I eat popcorn waaaay too much.